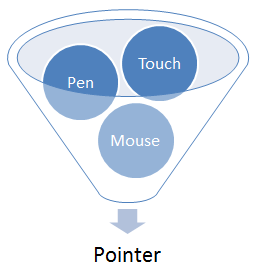 This document defines events and related interfaces for handling hardware agnostic pointer input from devices including a mouse, pen, touchscreen, etc.. For compatibility with existing mouse based content, this specification also describes a mapping to fire [ DOM-LEVEL-3-EVENTS ] Mouse Events for other pointer device types. The Pointer Events Working Group has demonstrated implementability and interoperability with the Pointer Events test suite and implementation report. Feedback on the specification, test suite, or implementation report may be sent to public-pointer-events@w3.org (archives). While this specification defines a unified event model for a variety pointer inputs, this model does not cover other forms of input such as keyboards or keyboard-like interfaces (for instance, a screenreader or similar assistive technology running on a touchscreen-only device, which allows users sequential navigation through focusable controls and elements). While user agents might choose to also generate pointer events in response to these interfaces, this scenario is not covered in this specification. This specification does not provide any advice on the expected behavior of user agents that support both Pointer Events and Touch Events. For more information on the relationship between these two specifications, see the Touch Events Community Group. The key words MAY, MUST, MUST NOT, OPTIONAL, and SHOULD are to be interpreted as described in [ RFC2119 ]. The width (magnitude on the X axis), in CSS pixels (see [ CSS21 ]), of the contact geometry of the pointer. This value MAY be updated on each event for a given pointer. For devices which have a contact geometry but the actual geometry is not reported by the hardware, a default value SHOULD be provided by the user agent to approximate the geometry typical of that pointer type. Otherwise, the value MUST be 0. The height (magnitude on the Y axis), in CSS pixels (see [ CSS21 ]), of the contact geometry of the pointer. This value MAY be updated on each event for a given pointer. 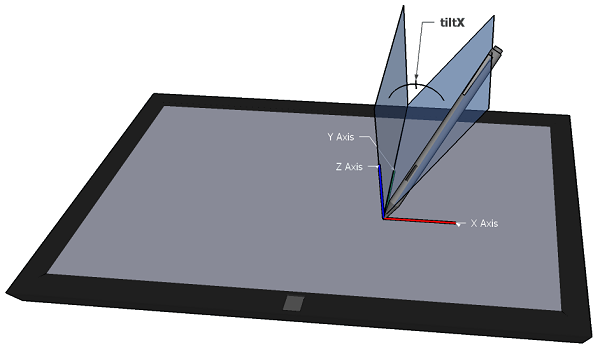 For devices which have a contact geometry but the actual geometry is not reported by the hardware, a default value SHOULD be provided by the user agent to approximate the geometry typical of that pointer type. Otherwise, the value MUST be 0. The normalized pressure of the pointer input in the range of [0,1], where 0 and 1 represent the minimum and maximum pressure the hardware is capable of detecting, respectively. For hardware that does not support pressure, including but not limited to mouse, the value MUST be 0.5 when in the active buttons state and 0 otherwise. Initializes the pointerId property of the PointerEvent object. Initializes the width property of the PointerEvent object. Initializes the height property of the PointerEvent object. Initializes the pressure property of the PointerEvent object. Initializes the tiltX property of the PointerEvent object. Initializes the tiltY property of the PointerEvent object. pointerType of type DOMString, defaulting to ""
Initializes the pointerType property of the PointerEvent object. Initializes the isPrimary property of the PointerEvent object. These values only apply when firing pointer events. This specification does not alter the values of button or buttons used when firing mouse events. See [ DOM-LEVEL-3-EVENTS ] for the values when firing mouse events. In a multi-pointer (e.g. multi-touch) scenario, the isPrimary property is used to identify a master pointer amongst the set of active pointers for each pointer type. Only a primary pointer will produce compatibility mouse events. Authors who desire single-pointer interaction can achieve this by ignoring non-primary pointers (however, see the note below on multiple primary pointers). In the case where there are multiple primary pointers, these pointers will all produce compatibility mouse events. On some platforms, the primary pointer is determined using all active pointers on the device, including those not targeted at the user agent (e.g. in another application). This means it is possible for the user agent to fire pointer events in which no pointer is marked as a primary pointer. For example, if the first touch interaction is targeted outside the user agent and a secondary (multi-touch) touch interaction is targeted inside the user agent, then the user agent may fire pointer events for the second contact with a value of false for isPrimary. To fire a pointer event name e means to fire an event named e as defined in [ DOM4 ] with an event using the PointerEvent interface whose attributes are set as defined in PointerEvent Interface. Set the relatedTarget attribute of the event to null. Fire the event to the pointer capture target override object. Otherwise, fire the event to the object returned by normal hit test mechanisms (out of scope for this specification). Further, if the pointer capture target override is not set and, the pending pointer capture target override is not equal to the hit test node for the pointer event which invoked this process, and the hit test node has received pointerover and pointerenter events, then fire a pointer event named pointerout and a pointer event named pointerleave at the hit test node. In the case of the primary pointer, these events (with the exception of gotpointercapture, and lostpointercapture) may also fire compatibility mouse events. A user agent MUST fire a pointer event named pointerover when a pointing device is moved into the hit test boundaries of an element. A user agent MUST also fire this event prior to firing a pointerdown event for devices that do not support hover (see pointerdown). A user agent MUST fire a pointer event named pointerenter when a pointing device is moved into the hit test boundaries of an element or one of its descendants, including as a result of a pointerdown event from a device that does not support hover (see pointerdown). This event type is similar to pointerover, but differs in that it does not bubble. A user agent MUST fire a pointer event named pointerdown when a pointer enters the active buttons state. For mouse, this is when the device transitions from no buttons depressed to at least one button depressed. For touch, this is when physical contact is made with the digitizer. For pen, this is when the stylus makes physical contact with the digitizer. A user agent MUST fire a pointer event named pointermove when a pointer changes coordinates. Additionally, when a pointer changes button state, pressure, tilt, or contact geometry (e.g. width and height) and the circumstances produce no other pointer events defined in this specification then a user agent MUST fire a pointer event named pointermove. A user agent MUST fire a pointer event named pointerup when a pointer leaves the active buttons state. For mouse, this is when the device transitions from at least one button depressed to no buttons depressed. For touch, this is when physical contact is removed from the digitizer. For pen, this is when the pen is removed from physical contact with the digitizer. 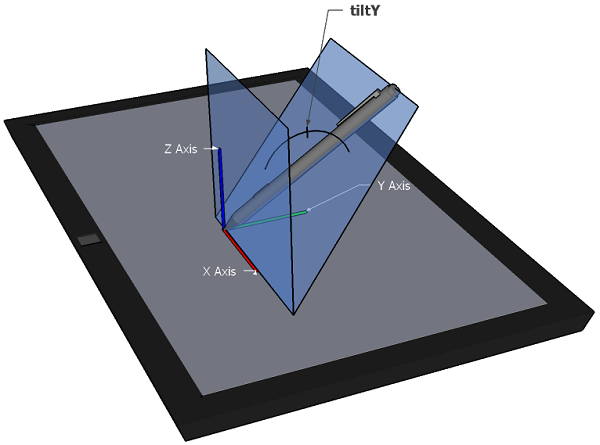 A pointing device is moved out of the hit test boundaries of an element. A user agent MUST fire a pointer event named pointerleave when a pointing device is moved out of the hit test boundaries of an element and all of its descendants, including as a result of a pointerup and pointercancel events from a device that does not support hover (see pointerup and pointercancel). User agents MUST also fire a pointer event named pointerleave when a pen stylus leaves hover range detectable by the digitizer. This event type is similar to pointerout, but differs in that it does not bubble and that it MUST not be fired until the pointing device has left the boundaries of the element and the boundaries of all of its descendants. Sets pointer capture for the pointer identified by the argument pointerId to the element on which this method is invoked. Subsequent events for the pointer MUST always be targeted at this element until capture is released. The pointer MUST be in its active buttons state for this method to be effective, otherwise it fails silently. Throws a DOMException with the name InvalidPointerId when the provided method's argument does not match any of the active pointers. The user agent MAY determine any permitted touch behaviors, such as panning and zooming manipulations of the viewport, for touches that begin on the element. The user agent MAY consider touches that begin on the element only for the purposes of horizontally scrolling the element's nearest ancestor with horizontally scrollable content. The user agent MAY consider touches that begin on the element only for the purposes of vertically scrolling the element's nearest ancestor with vertically scrollable content. When a user touches an element, the effect of that touch is determined by the value of the touch-action property and the default touch behaviors on the element and its ancestors. To determine the effect of a touch, find the nearest ancestor (starting from the element itself) that has a default touch behavior. Then examine the touch-action property of each element between the hit tested element and the element with the default touch behavior (including both the hit tested element and the element with the default touch behavior). If the touch-action property of any of those elements disallows the default touch behavior, do nothing. Otherwise allow the element to start considering the touch for the purposes of executing a default touch behavior. When pointer capture is set, pointerover, pointerout, pointerenter, and pointerleave events are only generated when crossing the boundary of the element that has capture as other elements can no longer be targeted by the pointer. This has the effect of suppressing these events on all other elements. If the pointer capture target override for the specified pointerId is not the Element on which this method was invoked, then terminate these steps. Some user agents implement their own implicit pointer capture behavior - for instance, for touch interactions, a user agent could automatically capture the pointer as part of an interaction on a form control (such as a button) to improve user interaction (allowing some finger movement to stray outside of the form control itself during the interaction). As part of this behavior, user agents typically fire gotpointercapture and lostpointercapture events, even though no explicit pointer capture functions (setPointerCapture and releasePointerCapture) were called. Immediately after firing the pointerup or pointercancel events, a user agent MUST run the steps as if the releasePointerCapture() method has been called with an argument equal to the pointerId property of the pointerup or pointercancel event just dispatched. When the pointer capture target override is removed from its ownerDocument's tree, clear the pending pointer capture target override and pointer capture target override nodes and fire a PointerEvent named lostpointercapture at the document. pointerover, then fire a mouseover event. pointerout, then fire a mouseout event. pointerenter, then fire a mouseenter event. pointerleave, then fire a mouseleave event. Many thanks to lots of people for their proposals and recommendations, some of which are incorporated into this document. The group's Chair acknowledges contributions from the following group members: Arthur Barstow, Matt Brubeck, Rick Byers, Cathy Chan, Scott González, Patrick H. Lauke, Sangwhan Moon, Olli Pettay, Jacob Rossi, Doug Schepers and Asir Vedamuthu. The following is an informative summary of substantial and major editorial changes between publications of this specification. A complete revision history of the Editor's Drafts of this specification can be found here. 20710 - Clarified the touch-action processing model. 20217 - Expanded touch-action property to include additional values: pan-x and pan-y. 20222 - Clarified that for hover menus the behavior is implementation-defined. 20872 - Clarified that multiple concurrent pointers can be primary. 20107 - Added a new set of button and buttons values to accommodate pen contact with eraser button pressed. 20108 - Added additional pointer capture details. 20109 - Added emulation (default values) for devices that do not support pressure. 20112 - Added pointerenter and pointerleave events using the same model as mouseenter and mouseleave. 20219 - Changed pointerType from long to DOMString. 20220 - Removed hwTimestamp in favor of a future DOM Event high-resolution timestamp. 20221 - Added constructor dictionary for PointerEvent. 20281 - Changed width and height to be CSS pixels instead of device pixels.